Find out about the best things to do in Longsheng. The list below is a number of the best Longsheng/Longji Rice Terraces attractions & things to do in Longsheng County - to find out more about each attraction, click on the corresponding link. Because of the hard work and intelligence of the ethnic minorities in Longsheng, the Longji Rice Terraces offers 4 different viewpoints for you to admire the incredible natural beauty, amazing terraces and authentic minority villages hidden in the remote mountains. Hidden in the remote mountains, Dazhai Village offers well-preserved houses, incredible natural scenery and a rich Red Yao ethnic minority culture to experience. Located at the base of the rice terraces, this village is the first stop for visitors to the Jinkeng Rice Terraces and villagers here still have a relatively pristine life. Would you like to explore the best-preserved, most ancient and the largest architectural complex (with a typical building framework of Zhuang ethnic minority) around Guangxi Province? Visit here! The 450-years-old Longji Zhuang Village is charming, authentic and a must-see village! ​Acclaimed as the “the World’s Longest Hair Village”, Huangluo Yao Village offers you a great chance to explore the Red Yao tradition of long hair. You will get acquainted with it through a close-up visit as well as the option to experience a Long Hair Show. 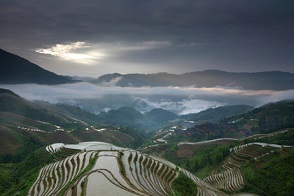 ​Interested in rejuventating yourself in hot springs after an unforgettable visit to the Longji Rice Terraces? The Longsheng Hot Springs is located approximately 1 x hour drive from the rice terraces and is ideal for you after a long journey. 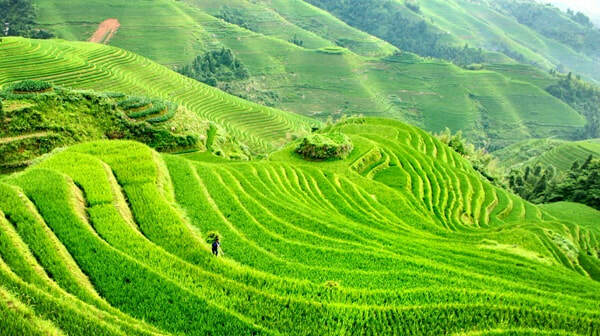 ​Set among the Ping’an Zhuang Rice Terraces, Ping an Village has a history of almost 500 years. WIth spectacular views overlooking the terraces, well-preserved Zhuang houses and local Zhuang festivities such as the Longji Bronze Drum Dance and Shigong Dance. ​Compared with the other two rice terraces areas in Longsheng, the Jinkeng Rice Terraces has the largest mountains and terraces within the region. It is home to Dazhai, Tiantouzhai and Xiaozhai Villages as well as local ethnic minorities. The Yao Ethnic Minority are the predominant inhabitants of the Jinkeng Rice Terraces. ​The Jinzhu Zhuang Village is the first Zhuang village after entering the gate of the Longsheng Rice Terraces Scenic Area. The village is located on a steep section of the Rice Terraces/Mountain and is home to a small number of Zhuang ethnic minority families who have lived here for a long time! ​Interested to explore the more natural and least visited Yao ethnic minority village in the Longsheng area? Tiantouzhai Village will be a perfect destination during your stay in Guilin. Its old buildings and unchanged lifestyle will take you back to the past. ​Zhongliu Village is a local village located in an isolated area of the rice terraces - between Ping'an Village and Tiantouzhai Village. Visitors hiking between these villages (and hiking between Jinkeng and Longji ) stop here to visit the Zhongliu Village. Interested in booking a tour? Please contact us to discuss!